This past weekend was a mommy and her girls weekend. Ron was back in Ottawa celebrating a good friend’s 40th so the girls and I decided that we would have a fun few days hanging out together without any boys (Bogie and Dopey don’t count). On Friday while the oldest was at her after school activity the youngest and I fuelled up on cupcakes and went gift shopping for a baby shower that three of us would be attending later on in the weekend. R and I had lots of fun exploring the latest trends, gadgets and fashions for society’s tiniest. To be honest, I can’t believe all of the cool things that they have now. The beautiful strollers were on display similar to cars in a dealer’s showroom. Pretty impressive and pretty pricey. My wallet is very glad those days are behind me 😉 R and I had tons of fun picking out the perfect present for our soon to be little friend. Yesterday, Sunday, was a very special day for the girls. 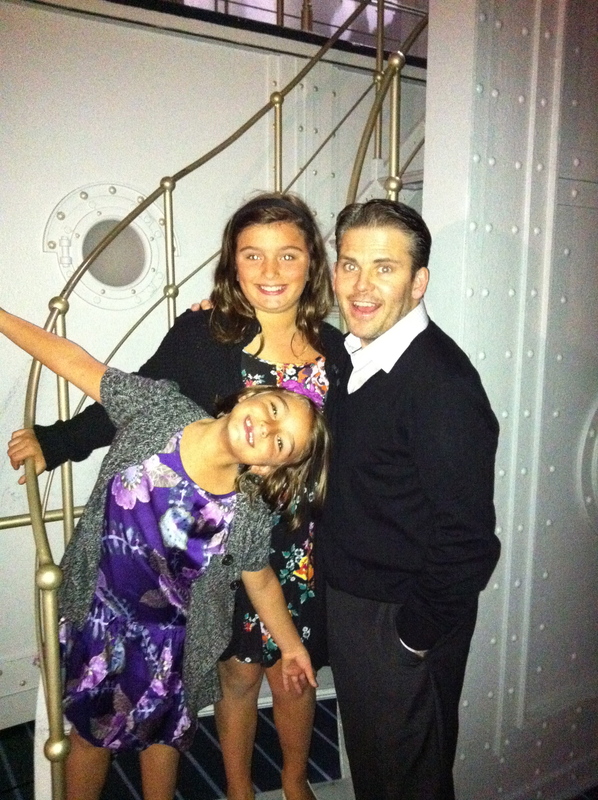 We went and saw”Uncle Bobby” Robert Creighton in the Broadway show “Anything Goes”. He is currently playing the role of “Moonface” Martin and we wanted to make sure that we saw him in this incredible part. 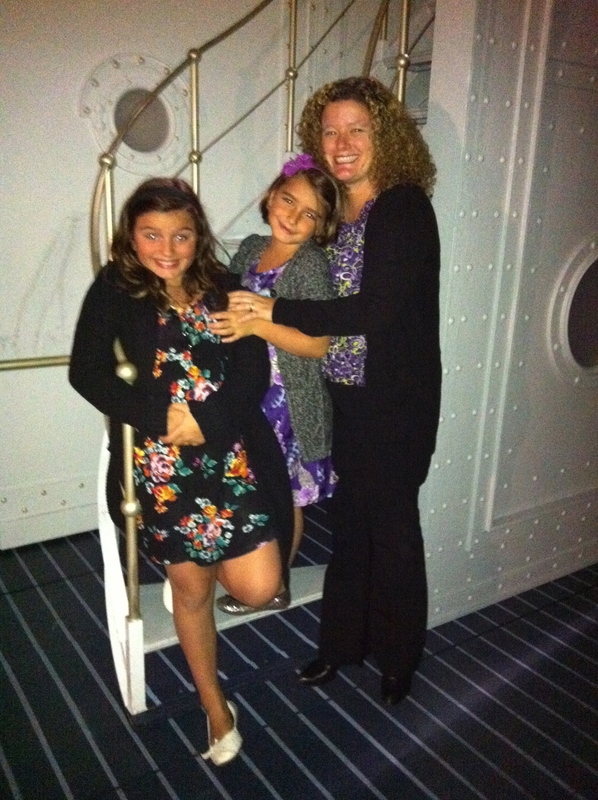 The girls were beyond excited as they bounded off the subway and we made our way to the theatre. 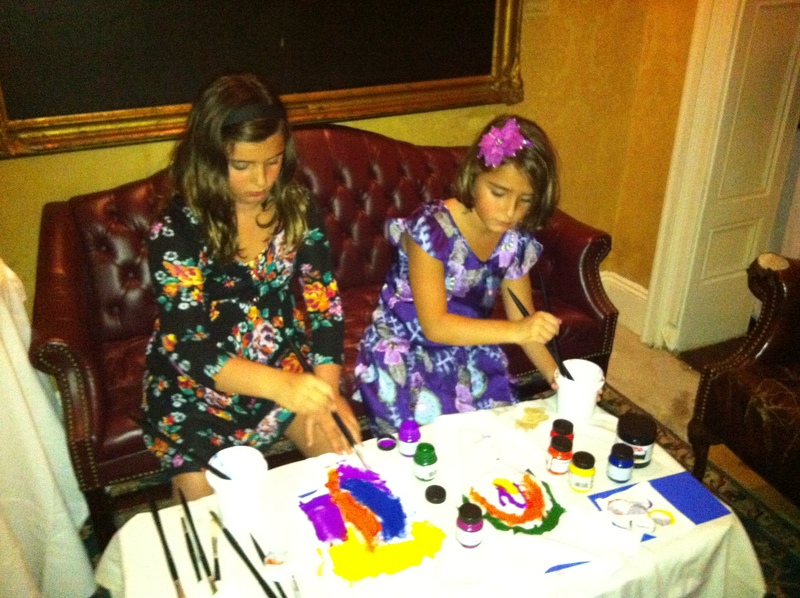 I was extremely proud of both of them as they behaved perfectly, swept away by the magic of the show. They loved seeing Uncle Bobby and laughed each time he came on stage. R loved all the little bits of funny going on while A stated afterwards that “you have to watch the actors if you want to be an actor”- uh oh, I think that girl really is destined for the stage. After the show we were able to go backstage where the girls toured the wig room, checked out the dressing rooms and were able to see all of the cool props and costumes. Such a wonderful afternoon. After the show we headed on over to the baby shower for the soon to be little RJ. It was a fairly grown up affair and everyone was tired (well, Mommy was!!) so we didn’t stay too long. But the girls had a lot of fun making unique onesies and practicing their manners by wandering around and mingling through the people. Best of all, they were able to bring home cookies and blue foil kisses that said “it’s a boy!”. Uncle Bobby sure was glad to have them there. 🙂 It’s fun to know that they’ll always have that memory of coming to that show, that Sunday. Who knows…maybe when A is performing on Broadway and telling her story of what lit the spark in her to want to be there…that Sunday will be part of the tale!! 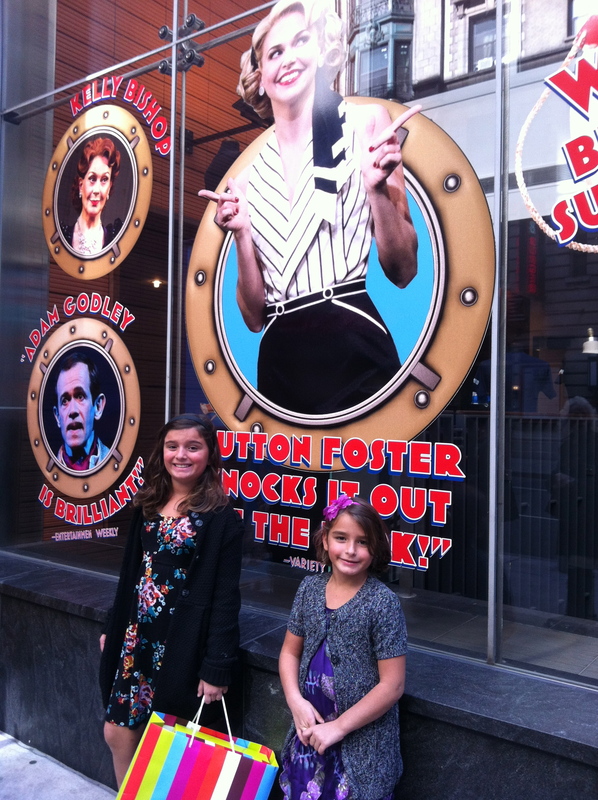 Isn’t Sutton Foster just a doll? I saw her in Thoroughly Modern Millie and I thought she was wonderful!